It’s mid-July. I have spent yet another Summer Saturday reveling in all that I find peaceful and life-giving. I am overwhelmed with it because it sure has been a long-time coming. Quite honestly, I cannot even remember such a perfect Summer weather-wise. I believe its been about 7 or 8 weekends in a row of sunny, mild, minimally humid days. Yes, we’ve had some days in between that have been less than perfect, but quite honestly, it justifies getting things done indoors and has actually been welcome! Today I spent the day harvesting squashes, tomatoes, rosemary and basil. The garden is picture perfect this year - not just in how it looks, but it is producing nicely. I am trying to keep up on the zucchini and have baked 8 loaves of zucchini bread so far with more to come! I’m trying out lots of new recipes - some good, some not so good, but you have to try them or you’ll never find that new favorite! Tomorrow I’ll try a new zucchini bread recipe that has coconut in it (coconut is one of my favorite flavors.) My tried and true zucchini bread recipe is my absolute favorite and as easy as can be to make. I’ve put the recipe at the end of this post. Our gardens have been such a joy this year. I’ve planted lots of new things. Red and black raspberry bushes that’ll take a few years to mature. A couple blueberry bushes… a pink wisteria that is actually purple… but that’s okay. It’s still gorgeous. 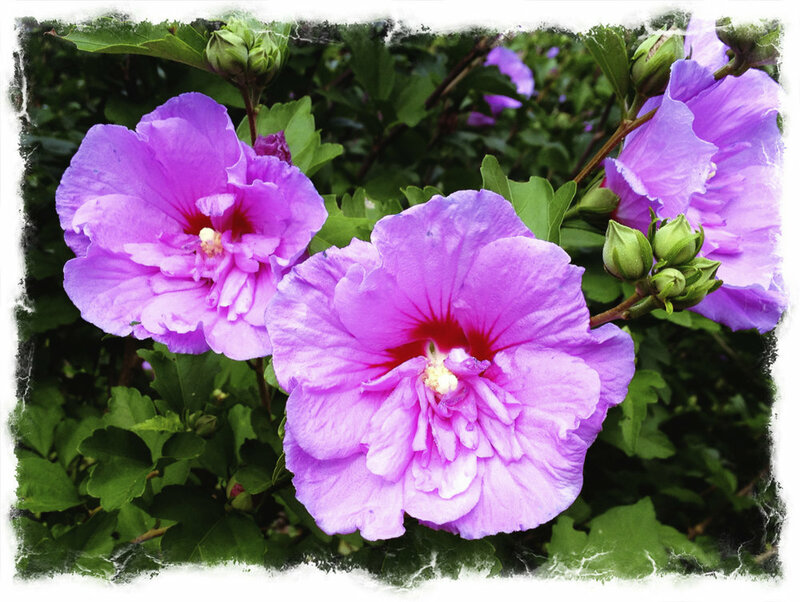 Three new ‘Rose of Sharon’ plants that will have bright blue flowers with magenta centers. The Rose of Sharon that we already have, have begun their month-long showy flower blooming. 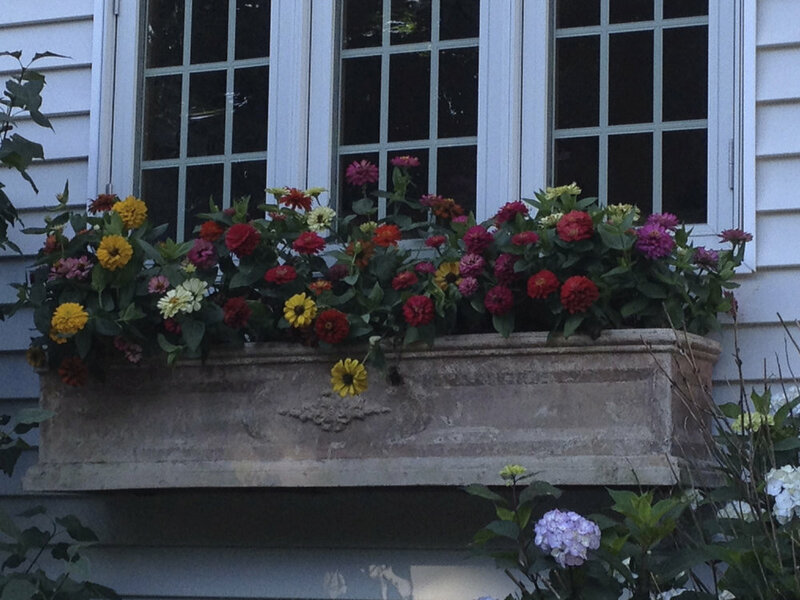 These plants are amazing and make me happy every time I wake up to see it out my windows. We have three and they are huge now and the blooming is prolific for a whole month. 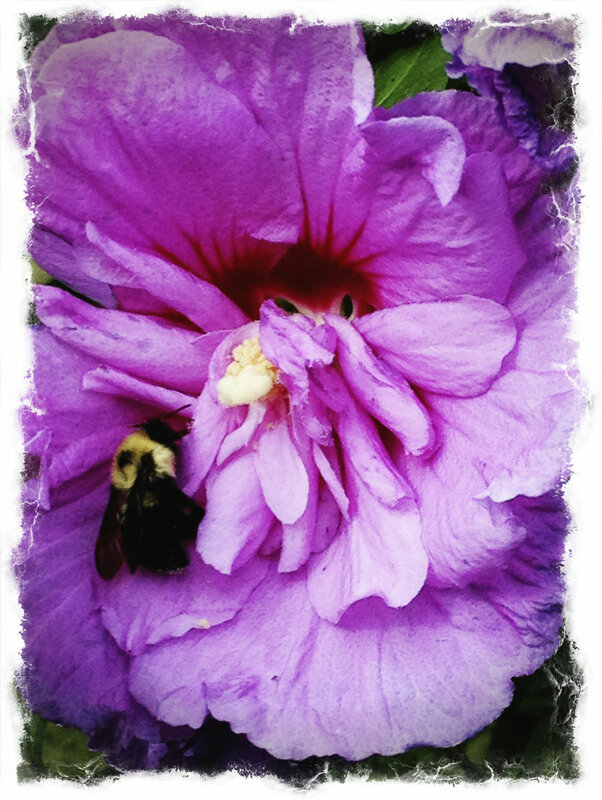 I love all the bumble bees enjoying the Rose of Sharon. Caught this one in flight! I had read an article a long, long time ago which said that you should garden from the inside of your house; meaning, you should garden so that you can see it from the inside of your house for the most full enjoyment. It is completely true advice. Even though there are places that need gardening that you cannot see from in the house, I try as much as possible to approach new plantings from this perspective - especially the bigger plantings like trees and shrubs. One of the biggest troubles I’ve had with gardening where we live are the deer that eat everything. This year, however, I’ve been using this spray that is all natural and is made with rotten eggs! I’ve sprayed it on all the plants and to my amazement, IT WORKS!! I cannot tell you how happy this has made me. I have hostas that I have never seen grown full out because of the deer - and this year they are whole and beautiful! The Rose of Sharon are rather misshapen because of the deer, but now they are filling out and I am delighted! I feel like I have a new lease on gardening! This fall I will be planting TONS of daffodils and other bulbs. I am very excited about it. Lastly, another reason why the above gardening details have been so fulfilling to me is the fact that I have purposed to not make any kind of plans for the Summer. In May I finished school and promptly collapsed from the stress and rigor of the work of the last year. I thought it would be just a week of time off to decompress, but it took about a month for me to really register and re-orient my thoughts and let that understanding pervade my being! Even now, I get moments of realization that it is done and a wave of relief and peace fill me. I then do a little happy dance. :) It has been important for me to take this time, doing just what is needful and no more. 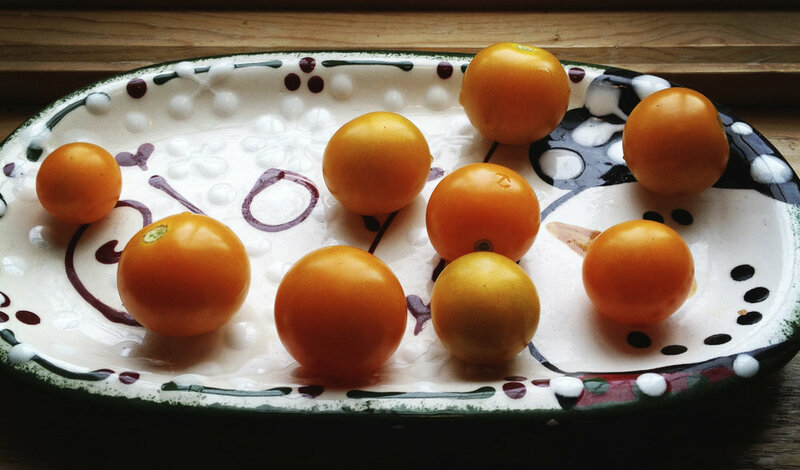 Today when I stood in my kitchen after harvesting the garden, I felt like a kid in a candy shop - except my candy was delicious yellow cherry tomatoes and deciding what I wanted to create with all this loveliness! It’s a little hard to convey why today was different from the many other times I’ve stood in my kitchen to create, but it really has to do with this purposeful intent to keep life quiet and restorative. Here is Auntie Gladys' Zucchini Bread Recipe - easy peasy. Be prepared to have the most wonderful aroma fill your home!